The best programmable pill dispenser is also lockable. This post was done in partnership with The Sweethome, a buyer's guide to the best homewares. When readers choose to buy The Sweethome's independently chosen editorial picks, it may earn affiliate commissions that support its work. Read the full article here. After researching 22 pill dispensers and testing six, we think the GMS Med-e-lert Automatic Pill Dispenser is the best and simplest programmable pill dispenser available. It's easy to load and about as simple to program as a VCR clock, and it has 28 trays with six possible schedules. It's also lockable, so if necessary you can make sure that the person taking the medicine has access only to the prescribed dose. 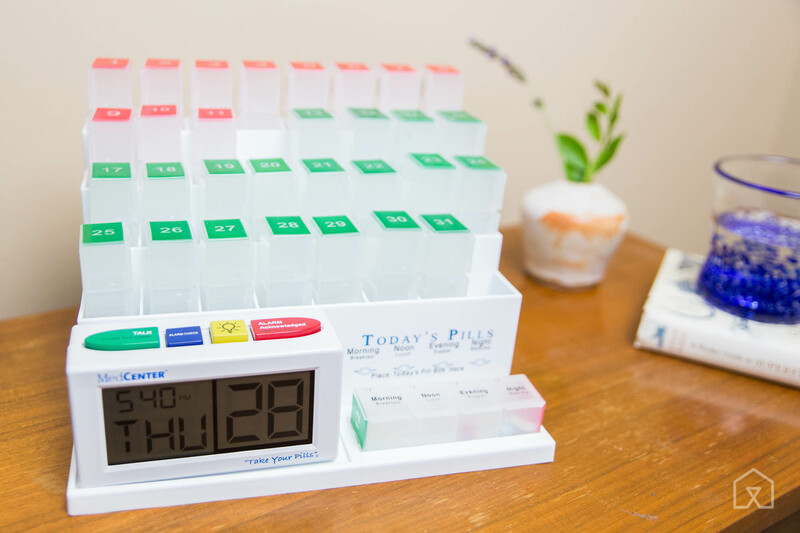 Simple pillboxes allow anyone to quickly organize their prescriptions, but adding a little digital technology to these boxes makes them even more useful. A so-called "smart" pill dispenser may audibly or visually alert a patient that they need to take their prescriptions. The dispenser can be tamperproof or lockable to avoid overdosing. 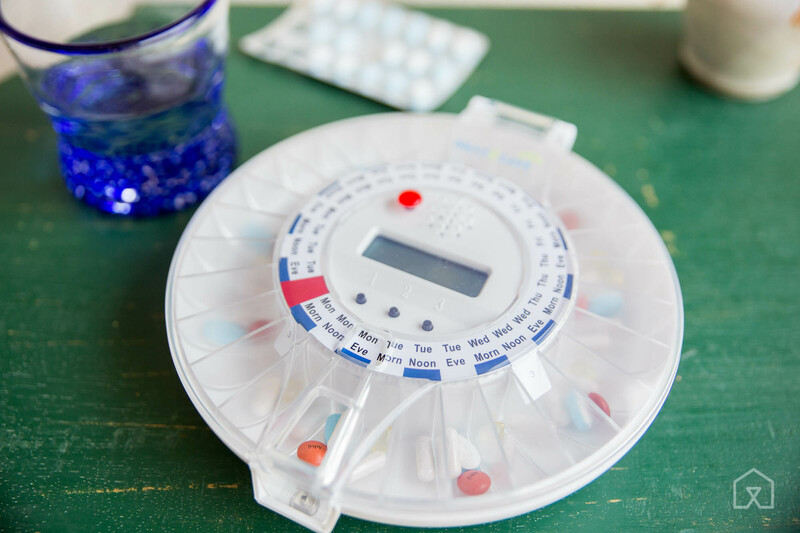 More intricate designs incorporate SMS technology to alert the caregiver as to whether a prescription dose has or has not been taken in a certain window of time. Oddly, we found few meaningful reviews for these kinds of devices, despite the fact that much of this country's aging population will require some kind of multiple-medication management. Without the guidance of reviews, we scoured Amazon and geriatric-care websites to see what was popular and available, and we pulled together a list of 22 devices for possible consideration. We then tried to test these devices as if we had purchased them ourselves for a complex prescription regimen. We wanted to see how far we could get programming a schedule without relying on instructions, to get a feel for how intuitive each device was. Instead of drugs, we filled each device with Skittles and stuck to strict candy doses throughout the day: red in the morning, yellow in the afternoon, purple and green at night. 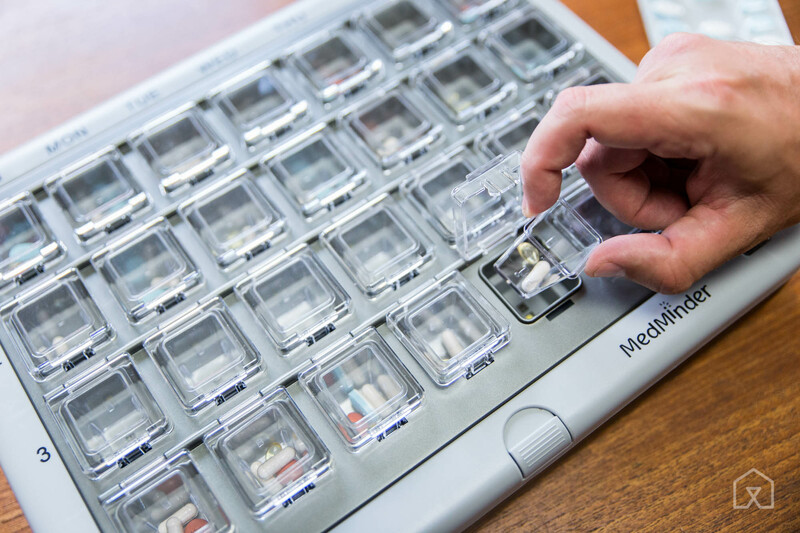 The GMS Med-e-lert Automatic Pill Dispenser is a standard automated disc pill dispenser made up of 28 individual trays, each of which holds up to 18 aspirin-size pills. A lid covers the entire device, with one open slot for delivery. As the device turns along its schedule, it moves a tray prefilled with medicine into the delivery slot and triggers a flashing light and alarm. The alarm sounds for 30 minutes or until you dispense the medications by turning the device over. The Med-e-lert is lockable, and it works with either a solid or transparent faceplate. It also comes with six swappable schedule discs, allowing you to set up to six doses per day, and a one-year warranty. The Med-e-lert is easy to fill in one sitting. The cover lifts to reveal all 28 trays arranged in a circle, which means you can load all your pills at once. After testing these devices for a few weeks, we can't stress enough how important this one feature is: Nothing is worse than having to open up 90 individual tabs while also sorting out your medicine (in our case, Skittles). Though we've noticed complaints about the Med-e-lert's waterproofing and unintuitive interface, we don't think these are dealbreakers for most people. The large Med-e-lert dispenser is also not portable; it's made for someone who takes their medication at home. If the Med-e-lert isn't available, the LiveFine Automatic Pill Dispenser is a good alternative. It's currently a little more expensive, but other than the branding, it's an identical device. 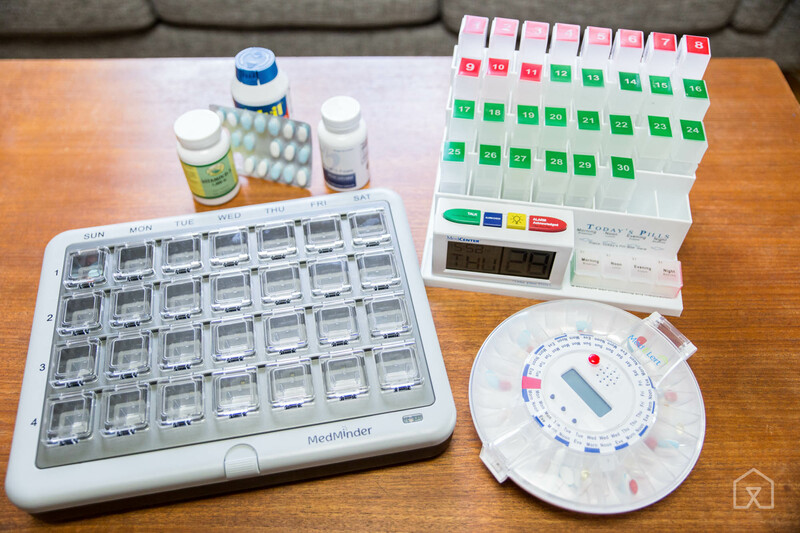 Fundamentally, the MedCenter System Monthly Pill Organizer is an organizer for generic plastic pillboxes similar to what you might find at a CVS pharmacy. That's both a blessing and a curse. It's utterly simple to use, but it requires more actions for daily management than our main pick. We wouldn't recommend this model for any care situation where the patient easily becomes confused or forgetful. The MedCenter System is made up of 31 boxes, each of which has four labeled chambers: Morning, Noon, Evening, and Night. On either side of these boxes, the number of the day is printed, once in red and once in green. At the beginning of the month, you fill all the boxes with pills and stand them with the green number facing up. 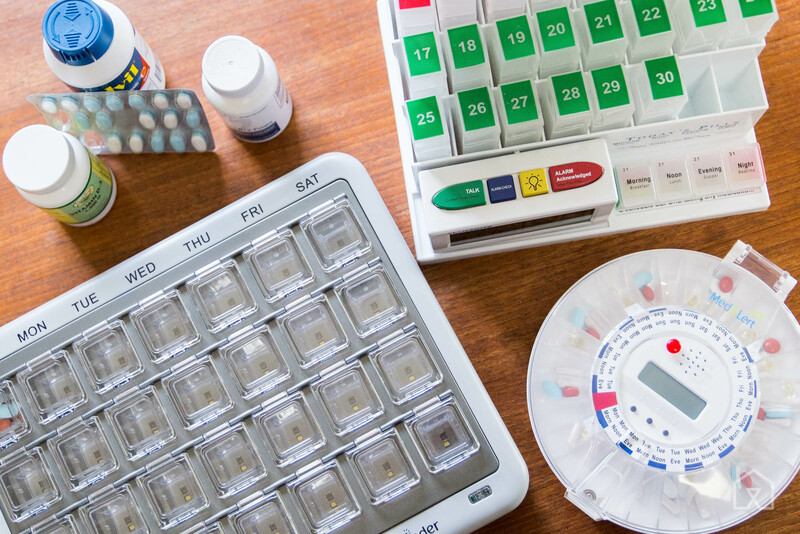 It's not fun to load the trays, but if you find yourself needing to manage an arduous prescription schedule, this is an effective and easy-to-manage option. As you go through each day, you flip each box over to mark it as empty. The included talking alarm clock that tells you when to medicate is the simplest clock to program that we tested. We found it intuitive to work with right out of the box, and about as complicated as any clock you might find on a bedside table. The Internet-connected MedMinder Maya was made to help caregivers who need a way to remotely or intermittently manage a loved one's medicines. The Maya comes with a built-in SIM card that connects the device to MedMinder's website; this connectivity allows the caregiver to remotely manage the Maya's schedule and monitor whether they've removed the pills in the correct dosage. You have no need to connect the device to any existing infrastructure in the patient's home—all the Maya needs to work is a power outlet. The Maya is built to look like a common pillbox with a removable cover that gives access to every slot. Once each tray is loaded with medication and the patient's schedule is set, the Maya lights up the appropriate compartment while also prompting the patient with an auditory cue similar to that of an office intercom—and, if you like, optional phone calls, text messages, and emails. The machine logs all tray activity, which a family member may check at any time, or the machine can summarize the activity and send it as a weekly email report. MedMinder also offers a mail-order medication service, which centralizes your prescriptions at a single pharmacy for the cost of your pharmacy co-pay. The MedMinder pharmacy sends a prefilled tray, which slots easily into the Maya. The pharmacy checks the schedule against doctor's notes, flags any possible drug-to-drug interactions, and programs the patient's Maya with the correct schedule. Unlike our other picks, the Maya is a subscription service and currently costs $40 per month (the lockable version, called Jon, is $60 per month). There is no contract: Once you're finished with the device, you cancel your subscription and send everything back to MedMinder.